Ultra High Definition (UHD Broadcast) and 4K (DCI Standard) are not new standards in the film and broadcast industry. Red released the first 4K capable digital camera in 2007 with the Red One. Since that time many camera manufacturers have seemingly tip-toed along toward releasing 4K cameras designed to serve the top tier of the market – at a premium price. This past year we’ve finally begun to see the release of affordable offerings better suited to support Indie filmmakers and video producers working on smaller budgets. Blackmagic Design began shipping the 4K Production Camera in February which was quickly followed by the Panasonic GH4 in April. These cameras are now available for under $4000 and $2000, respectively. Prior to this product release the only 4K capable cameras available were well in excess of $10,000. As with most price drops, they tend to have a disruptive impact on the “establishment.” It is inevitable that 4K/UHD will experience rapid adoption in the coming years as videographers and filmmakers compete to deliver the highest level of value and quality to clients. So What Production Benefits Can Clients Expect? First – The Cleanest HD At Any Price. 4K can easily be downconverted to HD and during this process more noise is removed from the image and more color detail and dynamic range is preserved than what a traditional HD camera sensor and imaging pipeline is able to deliver. Distribution of HD will likely continue years into the future due to the fact that many will be viewing their content on ever-cheaper and larger HD displays. Full HD displays continue to provide the same image fidelity of 4K displays beyond a viewing distance of around 10 ft (as far as what the human eye can see). Second – Still Photographs. 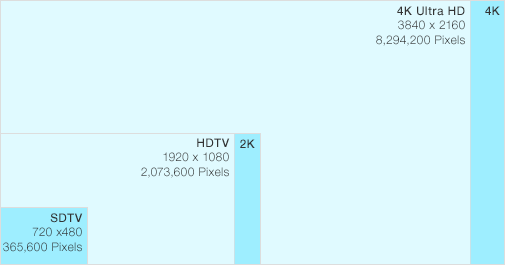 One video frame mastered at 4K resolution is the equivalent of a 9 megapixel photograph. This resolution is more than adequate for a photo print up to 8 x 10 inches in size. Capturing such detail at up to 30 frames per second delivers an incredible opportunity to select the perfect expressive moment in an image sequence. This means more options for clients looking to maximize their content acquisition ROI and more chances to acquire the “perfect moment” for use later in print literature and other static distribution mediums. Third – Future-Proofed Archive Masters. Based on the high pixel-density inherent to 4K, it is safe to say that content captured today will be just as rich and beautiful years down the road. It is true that similar comparisons were made regarding HD upon it’s adoption but at that time it could not be said that HD exceeded the human eye’s ability to perceive resolution, 4K can reliably make that claim today. While I have no doubt 8K resolution will again be pushed years from now, it is much more likely that future advances in image quality will be relegated to achieving higher color bit depth and dynamic range as an effective means to lure new customers. Fourth – Post-Production Flexibility. One of the greatest features of 4K is the ability to zoom and reframe composition digitally in post without a loss of resolution (at HD finishing levels). This allows the cameraman the flexibility to frame a shot a little wider than he or she normally would to provide some flexibility in the final edit.